An artist’s development can be seen as one long cognitive process and his works as the results of the experiences and influences he encounters on his way. Everything can be included in these sources of inspiration, including the works of other artists. But the absolutely essential prerequisite will always be his own works. An artist will usually only move in one direction, whether he be a painter, sculptor or graphic artist, or whether he does all three. He gradually moves ever further away from his first beginnings, his artistic starting point. But his work does not for that reason lose any of its continuity. For figuratively speaking, every single work builds on its predecessors, just as each work is also an absolute prerequisite for what had to come afterwards. This is true of most artists. But it is not true of Lars Nørgård. He is not one of those whose development follows a straight course and who never look back. There is no doubt that he develops. For all major artists do. But he does not do so in a linear and predictable fashion. The process is rather cyclical and can be divided into periods in which each individual period can almost take on the form of a reaction to its predecessor. There are two extremes in Lars Nørgård’s art. We could also call them antipoles because they ought to be mutually exclusive. One of them is clear figuration, the other an attempt to move away from figuration, that is to say an abstraction. These two poles have each attracted the artist in turn. All the statements he has made over the years have been dominated and marked by one or other of these two influences. But what can be said about it is just that every statement he makes always seems to bear its own antithesis within it. If a work looks like pure abstraction, it is quite certain that figuration is lying in wait somewhere or other in the overall picture. And scarcely has figuration asserted itself again before abstraction prepares to retaliate. Every painting contains an embryonic anti-painting waiting again to constitute the only truth on visual art. But there is never only one single truth. In the case of Lars Nørgård, we are forced to pluralise the concept of truth. These truths sometimes actually come into confrontation with each other, each maintaining its own truth. For it happens that one essential expression has simply not disappeared before another one – equally essential to the artist – has spread to another part of the canvas. This is the case with the three-metre-wide painting En lystløgners drøm om femørens fald (A pathological liar’s dream of the penny falling) from 1998. In Lars Nørgård‘s work there are always shapes and figures that awaken one kind of recognition or other. Similarly, there is also something we had simply not expected to see, certainly not in this specific context. There is one figure in this painting that strikes us in particular. This is ‘Pinocchio’. Why? Because he plays both roles. He is both what we have seen before and what surprises us in the context of this painting’s composition. And the choice of him is no coincidence. Pinocchio is a story about a wooden puppet that dreams of being changed into a real boy. But this transformation is conditional on the puppet’s behaviour being perfect. Meanwhile, Pinocchio has a nose that shows whether he is telling a lie. For when he is not telling the whole truth, his nose starts to grow – and it grows longer and longer the more the owner of the nose insists on his own alternative version of the truth. In Walt Disney’s film, Pinocchio goes on until his nose has grown into a branch with twigs, leaves, a bird’s nest full of chicks and so on. For there is simply no limit to what things can turn into if you once chose alternatives to the truth. Especially the truth that is said to be the sole truth. But you have to be like the good blue fairy in Walt Disney’s film not to be even a little curious to experience anything apart from this sole truth. In A pathological liar’s dream of the penny falling, this truth has been challenged in no uncertain terms. Not only has Pinocchio’s nose become as long as a broom handle, but the unusual story has also quite deformed one of the puppet’s legs. It has become big, fat and square like a wooden beam, and the end of the leg has been transformed into a crossbeam representing a foot. Not only does this foot stand straight up as though it had been nailed or glued on to the rest, but it has been given a face with eyes, nose and mouth. If it had not been for the long pink tongue issuing from its mouth, this extremity would look like a piece of exemplary cubism. The tongue is also longer than tongues normally are, for it just reaches a penny stamp, licks it and supports it so that it doesn’t fall down. So if it is the stamp that symbolises the penny, the penny doesn’t drop after all. And so perhaps it is a dream. On the other hand, everything piling up behind the little perforated stamp seems to be collapsing. Even the framed painting, which is rather like a sketch for a Lars Nørgård painting, seems to be falling apart. Even the framed painting that might resemble another sketch in a Lars Nørgård painting looks as though it might collapse if it were not precisely balanced on the extended tip of Pinocchio’s nose. In other words, it is the symbol of non-truth that saves the picture in this case. That the painting A pathological liar’s dream of a fallen penny is about a pathological liar, someone who delights in lying, there can be no doubt. For Pinocchio is smiling all over the penny, i.e. all over his face, and his black eyes radiate happiness. And why should he not be happy? If you don’t keep to the truth but dare to make it up, everything can become more than it was. In other words, a fairy tale can be launched. So it can be necessary to cross the boundary between what is real and what is not. Simply in order to represent something that no one – not even the artist himself – knows beforehand. 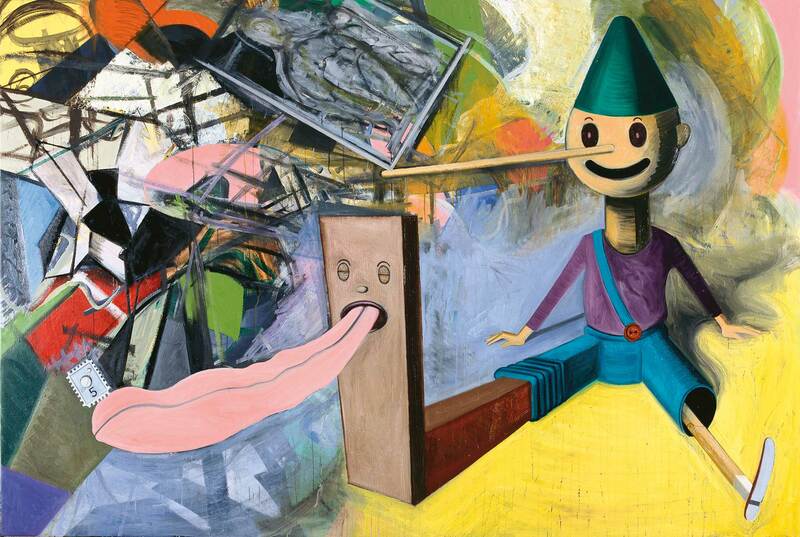 Perhaps this Pinocchio from the painting knows that if you didn’t occasionally doctor reality, embellish it, change, distort or merely supplement it and so on, there would not be anything called art. This activity is also known as fantasising, inventing, writing poetry and making use of your creative gifts. Or painting or drawing in the way of Lars Nørgård. If a 19th-century Italian author by the name of Carlo Collodi had not allowed free range to his imagination, he would never have invented the story of Pinocchio. And if, more than seventy years ago, Walt Disney had not further developed the tale that Collodi had made up, there would never have been an animated film called Pinocchio. And then no one would have known who Pinocchio was, not to mention the host of paintings, sculptures and drawings that would not have existed either. If the demand for truth were definitive, unavoidable and unconditional, the history of art would only have room for realists, neo-realists and so on. Indeed, perhaps not even they would have a chance of being taken into consideration. For even the most realistic presentation – whether painted, modelled or drawn – has one limitation: it must be content to present one single moment that is frozen solid in the technique with which it has been created. The image can do no more than suggest or create the illusion of any movement from one point to another. So an image neither can nor should ever compete with reality. On the other hand, however, an image can do something of which reality is not capable. It can rise above reality and thus enrich it. It can undermine our confidence in the limitation to which too prosaic interpretation of the surrounding world inevitably leads, thereby becoming a critical supplement to what we already know ad nauseam. This is what Lars Nørgård’s paintings and drawings do and always have done since he started producing them. To him, reality is not a narrow landing strip to which he always hopes his painting will show him the way back. Reality to him is rather a runway from which he has already taken off. To have a chance of seeing much more than we already know, it is a question of accelerating and getting completely off the ground and up into the air. When Lars Nørgård draws, he chooses a method further developing of that of the surrealists. When the classical surrealists drew, they always renounced intellectual control of what they were producing and abandoned themselves to the sub-conscious, to something beyond the control of the will and outside the power of experience. Even when they were fully conscious, they were still able to leave room for dream and all those strange notions that are buried in the deepest layers of the mind. All those things that are considered to be irrational, illogical and completely unpredictable. This was the only way in which the artist could surprise both his public – and himself. Lars Nørgård probably knows as well as the surrealists that there will always be room in the world for the enigmatic and the inexplicable and that people will always try to solve enigmas when confronted with them. Enigmas fascinate and capture. This is what makes the surrealist image into an eye-catcher. Lars Nørgård allies himself with an imagination that is not inhibited by the law of gravity, the law of perspective or other well established laws. Nor will he be hostage to the joy of recognition or the prisoner of all those ideas that are proclaimed as reasonable and necessary. On the other hand, he wants to maximise the preconditions needed for ensuring that the absurd can become absolute and allowed free rein. When the absurd takes over the surface of a painting, it immediately claims our attention. Most people will take an extra look and be well aware that more is needed. For the absurd is the humorous assistant to the enigma. The imagination has been given a free rein in the drawings, and Lars Nørgård is present as both passenger and observer. An artist scarcely always knows where his own lines will lead him. For during the actual process of drawing, this line can change into something quite different from what either he or the viewer expected, indeed into something that logically speaking ought not to be able to exist anywhere but on a piece of white paper. All we need to convince ourselves of the correctness of this statement is to take a look at the drawing of The Great Escape from 2011. The title is to be understood ironically, for on the face of it no one is moving and therefore no one is able to escape. The fox in the light aeroplane certainly can’t, for one blade of the propeller has been replaced with its big bushy tail. This is perhaps the reason why the fox doesn’t have a tail to be seen. But it is clear that the aeroplane is not moving. Perhaps, too, it is not moving because the wheels have been transformed into a snail, a large black slug that merges with the earth. What applies to Lars Nørgård’s drawings is also true to a certain extent of his paintings, many of which are based on drawings. And every painting, too, can only answer to the parameter of its own reality. Its truth value as an artistic statement is determined exclusively by what happens within the frame. For the quality of the picture is determined purely by whether it works, whether it functions, whether it means anything – as an image. However, the meaning changes. There is a world of difference between the portraits by the artists from Værkstedet Værst from the mid-1980s and the wildly imaginative figurations from the 1990s. The difference is at least as great as that between these figurations and the abstract paintings created after the millennium. But it is only a question of apparent differences. For it is the same artist who has painted all these pictures, and although this artist wants to move on at regular intervals – and perhaps even escape – he is also a fugitive who crosses his own tracks. In A pathological liar’s dream of a fallen penny Pinnochio is the figure who sets the entire painted work going. It is he who creates the impenetrable intrigue irrespective of the fact that he has also fallen a victim it it. And the same applies to the figure in the painting Cupboard from 1985. Without this figure, the picture would not mean very much. The light falls on him from the left, as it also does in the case of Pinocchio. But this light liberates neither of them. The figure is merely present in Cupboard, whereas Pinocchio is present in A pathological liar’s dream of a fallen penny. One of them is standing, the other sitting. The enigma begins in each case where these figures cease. For if we ask ourselves what happens beyond the tip of Pinocchio’s nose, we also have to ask what it is that is hidden in the cupboard. For there is always something in the cupboard, always something waiting for the right cue to be taken out. In the second half of the 1980s, when Lars Nørgård made his first really serious attempt at the abstract expressionist image, the figuration may well have been toned down. But it had not been exiled from his canvases for good. It was only put on hold. And so it also showed itself to be ready when there was need for it again. And similarly, when Lars Nørgård returned to figuration in the 1990s he put abstraction back in the cupboard. It was to turn out that he was again wise not to throw it away. For immediately before the millennium he returned to it once more, though this time in a more colourful version than ever before. For some thirty years, figuration and abstraction have been two different truths about painting, and Lars Nørgård could switch from one to the other as he thought fit. Note the expression “as he thought fit”. In this respect, Lars Nørgård is no different from other artists. In his case it is also a question of feeling comfortable in the complex process of producing an image from virtually nothing. No image can be produced without some kind of skill or ability. Assuredness and familiarity with the material do not, however, provide a lasting solution, and certainly not in the case of Lars Nørgård. For sooner or later the artist will weary of his own assuredness and his own growing familiarity with the material to which he has adhered in his motif in painting after painting. Under such circumstances a variation is not merely something that begins to tempt him. It delights him, too, and puts him at ease. This is how the dualism in Lars Nørgård’s painting is to be understood, the dualism between representation and non-representation. The artist can at will take out one optic and then the other. Both approaches are potentially available to him, and it is only the artist’s changing need to apply them that determines whether they become visible as a manifestation in the image or disappear for a time. Usually, they are competitive strategies in the arrangement and organisation of the picture surface. Lars Nørgård was born and grew up in Aalborg and trained in the School of Arts, Crafts and Design in Copenhagen. But he also undertook training outside Denmark, in the Academy of Art College in San Francisco. This background provided him with a technical skill such as few of his friends possessed, and he has more than once returned to it without ever having been content to rest on it. After returning to Denmark he continued his training – or his development – in what was known as Værkstedet Værst (The Workshop Worst), where he learned to turn his back on everything he had learned so far. Here, they experimented and tested new limits. And here they made films, happenings, sculptures etc. But this is not to suggest that he learned to forget those things that he merely refrained from doing. Even if you occasionally shelve certain technical skills, they have not disappeared. Thanks to its square shape and its expression, one of Lars Nørgård’s earliest works, This is just a temporary place to stay, from 1982, came to point the way forward to paintings that he did not do until twenty years or more later. It was also characterised by the same unmistakable energy radiating from somewhere near the centre of the painting out towards the sides. But the range of colours was much more limited than later became the case. The sparing use of colour was also a feature of the portraits that came from Værkstedet Værst. Different as they were from the abstract This is just a temporary place to stay, they were not done without good reason. In the middle of the eighties, Lars Nørgård had felt the need to link his motifs to certain people with whom he felt he had interests in common and with whom he actually mixed in his everyday life. These were the artists from the studio collective such as Christian Lemmerz, Michael Kvium and Erik A. Frandsen. They became his closest models. This can be seen even without knowing who is who. For there is no mistaking the similarity. The distortion, on the other hand, is the artist’s own addition. Perhaps he also wanted to see traces left by his own artistic temperament in these images, which clearly represented other people. And so his artist friends were subjected to something resembling caricature. They were interpreted and reproduced as though they were reflections from a personal hall of mirrors. The physiognomical distortions, deformations or misrepresentations made their mark on every single one of the faces he produced as memories of something that was closer to him than so much else. Perhaps the artist’s relationship with figuration was already unwinding here in the second half of the 1980s. Perhaps he was already escaping from the discreet but always dangerous embrace of portrait art. At all events, the human figure was subsequently destroyed from within in an expressionistic maelstrom that once more gave way to abstraction. Around 1988, it was as though a new expressionism sought to clear away everything that was recognisable. Chaos and confusion shattered the limbs in his figures, and what was left of them was mixed with swirling forces in a confusion of warm colours. These abstract expressionist pictures were often painted with the help of his hands and whatever was available such as shellac and cat litter etc. The method as well as the result invited comparisons with pictures from the legendary New York School, especially the paintings of the American artist Willem de Kooning. So perhaps after all something has rubbed off from the years Lars Nørgård spent studying in the USA and his time in San Francisco. The pictures were an apparent gallimaufry of bodies and parts of bodies that looked like the product of some murderous centrifugal force and which were then subsequently painted into a totality that was something other than its scarcely visible component parts. Something reminiscent of a face or a body could be made out here and there, but the rest was melted down into some raw colouristic state that could pass for a shambolic trial of strength between form and colour. At the beginning of the 1990s, the paintings changed again, this time into some absurd motifs that were worked out right to the last detail and yet were sufficiently unrealistic to be able to contradict all experience. With this, Lars Nørgård had launched the series of paintings that he has called his “story-telling production”. Everything that could be called respect for reason and relationships with reality was short-circuited. A kind of figuration had certainly returned to the canvas. But the figures did not come in the form of fragmented limbs or as bodies in conflict with the textural quality with which they had been created. They came rather in the guise of deformed supernumeraries in defiant battle with what was probable. Just as the classical surrealists had done, Lars Nørgård demonstrated in painting after painting that it is easy to portray situations that cannot possibly be verified. His clientele, however, was not that of the surrealists. In the case of Lars Nørgård there was a question of types that the artist himself had invented and which could be repeated in painting after painting even though with varying significance and in different positions. They were sailors with no foreheads, page boys in red uniforms or hunters whose gun barrels could be dangerously pointing back at the hunters themselves. They appeared in strange narrative situations invented by Lars Nørgård himself, perhaps as an artist’s defence of irrationality. With these motifs he sought to avoid exhausting an image as quickly as its motif could be appreciated. Perhaps the painting’s justification can actually be found in this element of unreality, as a troublesome and determined supplement to the reality we know. Lars Nørgård has never been interested in creating clear, rational links between what he has done before and what he is doing now. But it was as though he had embarked on a dual approach with his new figurative images. On the one hand he was taking up arms against reason and academic painting, and on the other against the abstract painting for which he had inherited inspiration from abstract expressionism. The attack was legitimate enough, seen from a painter’s point of view. For why should painting itself behave rationally and logically when everything outside the frame doesn’t? Existence is after all experienced as though there were no cohesion to it, as though it is simply a series of chance events, interruptions and fragments of something that can never come to a natural conclusion. If we look at Lars Nørgård’s work as a whole, it will tell us that all periods have been impermanent – that is to say short-lived transitions from one state to another. Everything obviously has its time, and when this time has passed the need is generated to create something completely different from what has dominated in the immediately preceding period. This sounds almost like a recipe for permanent rebellion. In 1998-99, when Lars Nørgård ceased producing narrative scenes, the reason was that these scenes gradually came to contain too few surprises for him and thus only a limited potential for development. The elaborateness in the manner of painting that the genre demanded of him brought him to a dead end. That was how he felt it. Contrary to his intention, he had ended as a painter whose task it would always be to realise something that he had already planned. Instead, he sought a new form of expression that was more improvisational and in which he did not always have to invent strange stories with equally strange figures that always demanded to be given graphic form irrespective of the degree of absurdity. All that was left from former times was the geometrical shapes and lines that were intended to structure the canvas, and then a host of shapes in the same array of colours that were to be found in a painting by Harald Giersing or Vilhelm Lundstrøm. Lars Nørgård’s new painting had ended as a confrontation with the dominance of earth colours or shades of grey that have characterised or – as some would say – terrorised Danish art. For Lars Nørgård is not what Hammershøi was once accused of being: a colour neurasthenic. He is not afraid of an abundance and superabundance of colour; he likes to maximise colours, to use large numbers of colours. In his opinion, a more exposed use of colours, simply dyes, makes the image more difficult to infiltrate and penetrate. The many spaces, outlines and planes that combine within the square represented by the painting prevent it from being transparent. And that is what it is all about: creating images that offer resistance when you try to see through them. If anything, Lars Nørgård wants not to be seen through. Just as the portraits from the 1980s could resemble distorted memories of a visit to a hall of mirrors, there was also a mirror effect in the conceptionless paintings by Lars Nørgård that now followed. This time, however, the mirror was simply broken into thousands of pieces; the overall universe was splintered, and what was left was a disorganised pluralism of bits and pieces. This plurality or manifold quality was as though cobbled together from hundreds of coloured surfaces, fragmented patterns and something that rather resembled the remains of everyday objects. With these paintings we sometimes have the impression of standing before a jigsaw puzzle that has simply been wrongly assembled. If only the process could be reversed and the bits in this smashed mirror put together again to form a whole, the bits would come together and the final result would form recognisable motifs and figures. Abstraction is never so far from figuration as might be thought. In the same way, neither is the unrecognisable completely unrelated to what can be called almost recognisable. The universe that catches your eye in a painting such as Caesar in the Coal Cellar or Luxury Visions is not quite like anything we have experienced before, and neither are there elements in the image that we can identify immediately. But it is not possible to escape the thought that the image nevertheless points to a truth that is merely twisted, distorted or fragmented, i.e. is broken up without anyone having taken the trouble to gather the bits again – in the right way. But perhaps it will only take a moment or two before things fall into place, and then the shapes begin to morph into something that can be called figurative. To paint such a picture presupposes that the artist dares to loose all his strengths on the canvas. At the beginning of the process he opens up the picture surface to anything that strikes him, or, to put it more precisely: everything that strikes the surface through him. The work is filled to bursting point with forces, and not only he but any other viewer will experience the way in which all these pull all over the place. Some infernal chaos seems to have arisen. For every single one of these elements is disguised or camouflaged differently. One is striped, another black, a third red or yellow or blue, a fourth has a surface structure like a piece of sticking plaster, a fifth recalls the year rings on a sheet of wood and so on. If there is a common denominator in these elements at all, it is only in the way in which they are positioned. They are all parts of the same painting, but so different that this incommensurable multiplicity must be a quite conscious strategy on the part of the artist. To be able to complete a painting such as Luxury visions or Caesar in the Coal Cellar requires that, after having let everything loose in his picture that he can mobilise, the artist can regain control of it and guide it to victory. All the stratified, opposing forces that the painted surface contains in abundance are now to be brought into a state of mutual balance. But they are not on that account to lose their individuality and their almost gaudy polychrome richness. Irrespective of the direction or the extent to which they draw us and irrespective of how incompatible they may seem, it must be possible to unite them in the overarching compositional unity that is the actual work of art. Otherwise it is not a work of art. There is yet another crucial feature in Lars Nørgård’s art. What he paints almost always seems to be bigger than the painting itself. In the paintings from recent years – after the fantasising figurations of the nineties – the motif is never limited to the centre, most frequently in drawings. The conflict that the artist conjures up, and which is the growth point for the painting’s life, does not only appear in one place, but in many places. It is almost a state. The agitation that the picture represents is not reduced as we approach its edge. As in This is just a temporary place to stay, this conflict has spread across the entire surface, and the tangible edge represented by the frame appears unable to stop it. A painting of this nature has no specific central point. Rather, it has an incalculable number of central points. The Americans call the phenomenon overall painting. And they use this expression in particular of paintings by artists such as Jackson Pollock, Cy Twombly, Marsden Hartley and Jean-Paul Riopelle. Lars Nørgård’s retention of this incompatible pluralism of shapes derives from one specific desire. This desire makes itself felt not only throughout his abstract paintings, but in everything he paints. It is the desire to create multiple contrasts or a contrasting multiplicity. “Abstract” comes from the Latin “abstrahere”, meaning to withdraw in the sense of withdrawing from an idea, from something representing a figuration, a piece of natural scenery, a landscape, in short a truth about reality. When you withdraw from something, get at a distance from it, the details merge into each other. They lose their individual quality, and a certain general family likeness will perhaps create a link between all those things in the totality resulting from the abstraction. That is not the case here. In Lars Nørgård’s abstract paintings, every shape and every colour insists on its incompatibility with the rest. Each part of the picture stands in a structural and colourist contrast to its immediate surroundings. The world does not unite simply because you distance yourself from it. What can have a manifold and incommensurable effect when seen close to remains so when the artist withdraws from it and creates abstractions on the basis of it. We must learn to live with all these varied concepts, all these different experiences that never acquire anything in common except that we experience them at the same time. As an image. Therefore Lars Nørgård insists on a plenitude of contrasts in everything he creates. It is not a choice. It is a condition. It is the only truth he respects.